Temper tantrums—those annoying kid wails and frails and meltdowns—are common. Studies show that almost 70 percent of young kids have them. Tantrums are equally as common in girls as in boys. Older kids sometimes resort back to the tantrum stage, especially if there’s been a recent stress or change in their lives or they’ve learned they work to get their way. So if tantrums are common, how do you stop them? New research finally gives parents important clues. Yale University and King’s College London findings tell us we can hold those sticker charts, fancy point systems or our pleads and threats. The techniques are largely ineffective in changing kid behavior for the long haul. 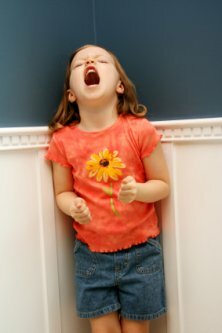 Studies confirm what is more effective in curbing a tantrum is how the parent responds to the outbursts. In fact, how parents respond will largely determine whether those kid outbursts decrease or increase. Here are a few tips I shared with Matt Lauer on the TODAY to do before, during and after the storm to curb meltdowns. I also had an enlightening phone chat with Dr. Alan Kazdin (who you may have seen in the B-roll before the set and author of Parenting the Defiant Child) who shared the parenting management programs his team at Yale is doing. His tips for praising good behavior and the using the “Untantrum Game” to teach more appropriate behaviors are below. Young kids do not have internal brake systems and need you to calm them down or their frustrations can quickly escalate. In some cases you have only seconds before an exorcism begins so don’t wait until your child is in full meltdown to apply these strategies. Your best defense is to anticipate a tantrum’s onset. Watch for your kid’s signs that a tantrum is on its way: tension, antsy, a whimper. Then try some of these techniques. Hint: You really have to experiment with what works for your child but these are worth the try. The biggest frustration triggers young kids are fatigue, hunger and boredom. You’ll reduce many of those meltdowns by taking him shopping after the nap or eating a snack, or letting him play with something while you wait. Try to redirect your child’s attention: “Let’s go get your teddy.” “I bet you can’t jump up and touch the sky! ?” Or try distracting your little one: “Look at that little boy over there.” Your best bet is to try to divert your child’s attention long enough to reroute his energy. But be quick-you may have only sections before the meltdown. I learned this technique from Dr. Harvey Karp, author of the Happiest Toddler on the Block, during a Parents magazine advisory meeting (we serve on the Parents board of advisors). Harvey is fabulous to watch when he talks to kids. I swear he’s the ultimate Toddler Tamer. Little egos are forming and their little independence streak is churning, so watch out for overusing the word NO which can cause frustrations. You’ll get far better responses if you turn your “Don’t run” into “Let’s walk.” Firmly phrase your instructions in terms of what to do, instead of what not to do. Once an attention-getting tantrum begins there is little you can do to control it, so remain calm. (I know, I know, but doing so is essential). Your calm behavior will help your child get back in control. Don’t give the outburst any attention. No eye contact, no words, do not react. Once your child learns that her outburst “works”—that is she gets her way—she’s likely to try it again (and again and again). In fact, research at Boston shows that the longer you give attention to a tantrum, the longer it lasts. Forget trying to rationalize with a wailing, flailing child. Doing so is like trying to reason with a goldfish. Once in tantrum-mode your child is beyond understanding. Also, don’t coax, yell, or spank. It doesn’t help, and you’re libel to escalate the outburst. Your goal is to teach your child “replacer” behaviors to reduce those outbursts and help the child learn healthier ways to handle upset feelings. ~Is warm and uses touch. Give him a hug, a big pat on the back or a high five! “See how nicely that boy is playing with others” (Do hold those judgments: “Why can’t you do that?”) Kids learn a new skill quicker by seeing, not hearing it. So don’t describe, but show the behavior you want your child to use. . The child then practices the new way of “untantruming” and you praise the heck out of the little rehearsal. Dr. Kazdin then suggests saying, “I bet you can’t do it again!” And most kids relish in trying again (and again, and again). The trick is to rehearse the new behavior many times so when the heat of the moment comes the meltdown doesn’t kick in, but the new pre-reheased behavior does. Try it! It can take weeks for behavior change. You should see a gradual diminishment of the tantrums. Track the frequency of those tantrums on a monthly calendar. You may be surprised (and elated) to discover those meltdowns really are slowing down! If those tantrums escalate, are more frequent, last longer in duration, or your child is in danger or hurting himself or others, then it’s time to get help. A recent APA publication advised that young children who have daily, intense temper tantrums are significantly more at risk to have later behavioral and emotional problems. Don’t wait! Early intervention is key! Follow me on twitter @micheleborba or on my blog, Dr. Borba’s Reality Check where I provide late-breaking parenting news and tips to raise compassionate kids with strong hearts and minds.